Metabolism is broadly defined as the sum of biochemical processes in living organisms that either produce or consume energy. Metabolism impacts all cellular functions and plays a fundamental role in biology. Research has been focused on understanding basic biological mechanisms that regulate metabolism and how they are dysregulated in disorders such as obesity, diabetes, cardiovascular disease, and cancer. A common root cause in these medical conditions is an energy imbalance and a better understanding of this disparity will help determine therapeutic strategies. Enzo Life Sciences offers a comprehensive toolset for discovery, analysis, and quantification of biomarkers for your metabolic research. Obesity is a serious health problem that leads to elevated triglyceride levels, which can lead to cardiovascular disease, diabetes, hypertension, and hypercholesterolemia. The identification of drugs that modulate differentiation and adipogenesis is essential to understanding and treating disease. One of the most utilized models for the study of differentiation of fibroblast into adipocytes is the 3T3-L1 cell line. 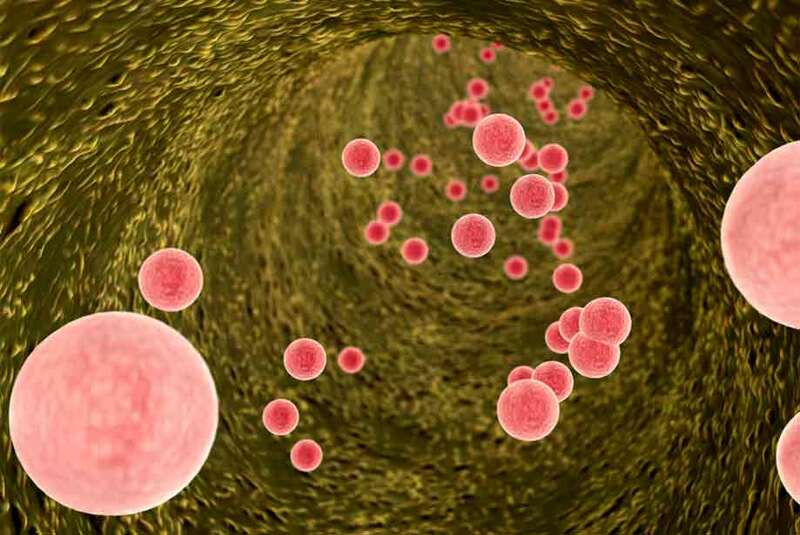 Our Adipogenesis Assay Kit is a complete kit for the qualitative determination of the differentiation of 3T3L1 cells into adipocytes. This kit can be used to either test agonists that induce adipogenesis or antagonists that inhibit it from occurring. The Adipogenesis Dye allows for visual confirmation of differentiation and allows ready measurement with spectrophotometer or microplate reader. Figure 2. Microscopic Analysis of Induction: 3T3-L1 cells were treated with and without induction media. After 10 days they were stained and imaged at 40X magnification. Figure 3: AdipoRon is a small molecule adiponectin mimetic. AdipoRon is a small-molecule adiponectin mimetic. At low micromolar concentrations, it binds to the adiponectin receptors AdipoR1 and AdipoR2. Additionally, AdipoRon is orally administered and readily absorbed and delivered to target tissues, making it potentially clinically relevant. AdipoRon has been shown to induce insulin sensitivity, inhibit lipid synthesis and increase glucose metabolism. Glucagon-like peptide 1(GLP-1) is an important target in Type 2 diabetes, as its secretion is diminished in these patients. GLP-1, derived from proglucagon, is a promoter of insulin secretion in the body. It is secreted in response to oral ingestion of nutrients, with lipids and simple carbohydrates being the most potent stimulators of secretion. 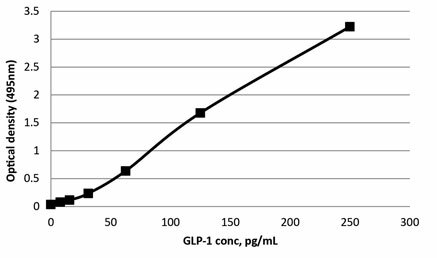 The ultra-sensitive AMP’D® GLP-1 ELISA Kit is a colorimetric ELISA kit which detects as little as 5.5 pg/mL Glucagon-like peptide 1 (GLP-1) in serum and plasma samples of human origin. Insulin is a peptide hormone made in the pancreas by beta cells. It promotes the uptake of glucose from the blood into tissues and inhibits the production of glucose by the liver. The disease diabetes mellitus results when control of glucose levels is lost due to lack of insulin production (type 1 diabetes) or when sufferers develop an inability to respond to insulin (type 2 diabetes). Insulin resistance has been linked to a variety of disease states including kidney damage and metabolic syndrome. Insulin immunoassays also help diagnose the presence of an insulin-producing tumor in the islet cells of the pancreas. Our Insulin ELISA Kit is based on colorimetric detection of insulin in serum, plasma, and tissue culture and is highly sensitive, detecting as little as 15.5 pg/mL. Proinsulin is composed of the A and B subunits of insulin and is connected by the C-peptide region. This protein contains 110 amino acids and it is synthesized as a single chain. Proinsulin is processed in the endoplasmic reticulum of pancreatic β-cells and is converted within immature secretory granules into insulin and C-peptide. The release of proinsulin is significantly increased in patients with type 2 diabetes as well as in individuals with impaired glucose tolerance (IGT). Our Proinsulin ELISA Kit is a colorimetric based detection of as little as 0.17 pM Proinsulin and has negligible cross reactivity with insulin. The adipokine leptin is a hormone secreted predominantly by adipose tissue that signals through leptin receptors in the hypothalamus to decrease appetite and increase energy expenditure. Elevated circulating levels of leptin are associated with increased obesity, indicative of an acclimated state of leptin resistance. 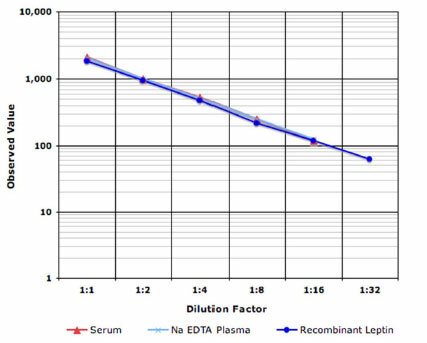 Enzo Life Sciences offers a range of human, mouse and rat Leptin ELISA kits for rapid determination of leptin in serum, plasma, and culture supernates. Figure 5. Recombinant leptin standard accurately determines leptin concentrations in biological matrices. Table 1. Detection kits of metabolic analytes. Metabolic biomarkers play an important role both in diagnosis and prognosis. In addition to Immunoassays, we offer many antibodies, proteins, and small molecules for metabolic research. Please contact our Technical Support Team for further assistance. Ultra-sensitive Proinsulin ELISA kit enabling detection of proinsulin in human serum and plasma samples in just 3 hours.